We’re excited to announce that Vetavision 2019 will take place on Friday and Saturday, September 27-28, 2019. For more details about this year’s event, please visit vetavision.ca. Or, please visit us on Facebook or Twitter! Don’t forget to fill out our Vetavision survey to tell us how you heard about Vetavision, what you liked, and how we can improve for Vetavision 2019! Vetavision 2017 has officially started! Come visit us between 8am and 8pm for amazing demonstrations, interactive booths, and your opportunity to see the amazing “art” that the Worms, Germs and Toxins has on display! You may notice during Vetavision that all our student volunteers are wearing orange shirts. That’s because the entire college community will be participating in Canada’s annual Orange Shirt Day on Sept. 29 and 30. So if you have any questions, just look for someone in orange! Orange Shirt Day began in 2013 after a commemoration event for the St. Joseph Mission residential school in Williams Lake, B.C. The idea for the special day came after a residential school survivor named Phyllis (Jack) Webstad shared her story of having her new orange shirt taken away from her on her first day of school. Organizers chose Sept. 30 as the annual Orange Shirt Day because it occurs during the time of year when many Indigenous students were taken from their homes to residential schools. Participation in Orange Shirt Day has since spread to communities across Canada, and the WCVM is proud to be the first college at the University of Saskatchewan (U of S) to officially take part. The WCVM’s unique T-shirt design was created by a group of students that make up the WCVM’s Indigenous Students Circle in collaboration with Jasyn Lucas and Nicole Brightnose, two artists based in Thompson, Man. Each element of the shirt has a meaning that comes from the Seven Sacred Teachings, values based in Indigenous cultural tradition. Each of these teachings are represented by an animal. The shirt features a white buffalo, four eagle feathers in a circle, and a turtle. Bray is from Winnipeg and a member of the Stellat’en First Nation. She helped create the posters that will be placed around the college explaining the significance of the shirt’s symbols. The eagle embodies love – in particular children are to be loved and cherished as gifts from the creator. The four eagle feathers in a circle represent the four directions of the Medicine Wheel. Each direction can also represent stages of life, sacred medicines, seasons of the year, phases of life, or elements of nature. The turtle symbolizes truth. “The overall theme is contributing to the spirit of reconciliation,” says Dr. Andy Allen, chair of the Dean’s Committee on Indigenous Engagement. He worked to get the college involved with the help of the WCVM’s Indigenous Students’ Circle. WCVM’s participation in the event will help to acknowledge the harm caused by the residential school system, to honour the survivors and to remember those that did not survive. Each shirt says “Every child matters,” a phrase reminding everyone that “we have hope for every child’s prosperity and success in the future,” says Allen. The fact that the WCVM students agreed to make Orange Shirt Day part of the Vetavision event is significant for both Allen and Bray. “Personally, I think it’s just a way to recognize that we are moving toward reconciliation. It’s important for my classmates to see and recognize the struggles that First Nation people have been through. For me, it’s almost like being accepted into the community,” says Bray. Student Katya Melnick is a Métis person and another member of the college’s Indigenous Students’ Circle. She helped design the shirt and says the event represents a way to create understanding about the legacy of residential schools. “I think it shows that we are acknowledging and understanding some of the issues people went through in the past with residential schools and the bullying that still happens due to racism,” she says. So far, the WCVM’s orange T-shirt has received a lot of positive feedback, with people from across Canada asking how to get one. Organizers hope the veterinary college’s example will inspire other colleges across the U of S campus to get involved. Visit the Orange Shirt Day web site for more information. The fistulated cow, one of our most famous attractions! And all kinds of other exotic animals! Come to Vetavision and experience the veterinary profession! Watch for Vetavision on Global Saskatoon Morning News tomorrow, Sept 27th, at 7:25AM! There may even be an appearance of a cute red-tailed hawk! And on Friday, Sept 29th, at 8:20am, keep an eye out for Vetavision on CTV’s Morning Live News! A mystery pet will be making a guest appearance! Want to become a veterinarian? Veterinary Medicine will have a chance to hear from Dr. Chris Clark, the Associate Dean (Academic), about the path to becoming a student at the WCVM. Don’t forget to register as the deadline, Sept 20th, is quickly approaching! For more information or to register, please visit our schedule. Dr. Tammy Wilde shares why you should come to Vetavision 2017! More reasons to come to Vetavision 2017! 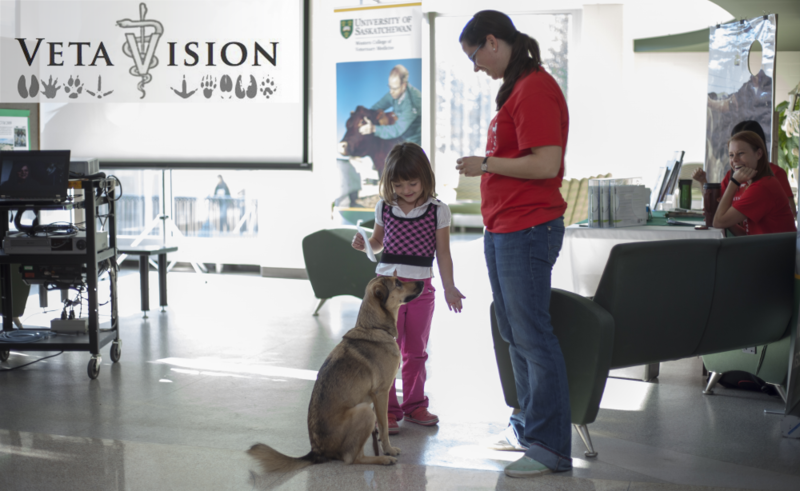 Check out our latest video for why you should come to Vetavision — the Western College of Veterinary Medicine’s public open house! Why you should come to Vetavision 2017! Vetavision 2017 is rapidly approaching and we’ve got a clip for you! Vetavision (Peter Watson, vet student) from WCVMToday on Vimeo. Why you should come to Vetavision!